It’s been a great summer for renting unusual bikes here in Kitchener-Waterloo. While I typically continue to make the Bicycle Forest collection available through the fall, this year we’ll be closing up early. Tomorrow, we’re heading off on a bike trip. We’re departing from Kitchener and hoping to keep pace with the changing leaves as we make our way south. 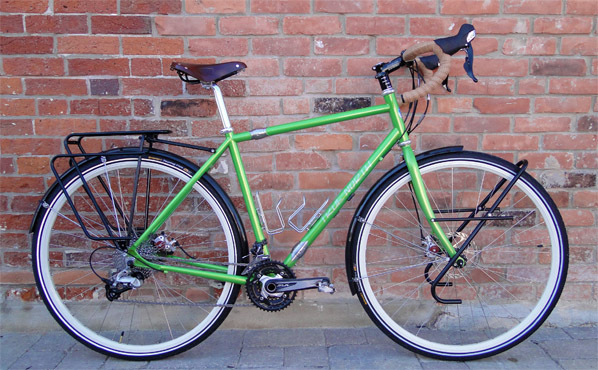 Thanks to the craftsmanship of Hugh Black at True North Cycles, Natalie has this beautiful new bike for the trip. I am happy to have finished BikeCAD version 10 before leaving. It’s good to see so many shops and builders have already downloaded the new update. I may not be as quick to respond to inquiries in the coming weeks, but I will still be making a point of checking e-mail while on the road. So please let me know if you have any questions. You are currently browsing the Bicycle Forest Blog weblog archives for October, 2013.